As the Sunset Limited makes its tri-weekly journey between New Orleans and Los Angeles, it offers passengers views of ecologically diverse bayou and desert landscapes, the United States-Mexico border and historic small towns such as Deming, N.M., where the Atchison, Topeka and Santa Fe and Southern Pacific railroads drove a silver spike in March, 1881, to mark the completion of the second transcontinental rail line. Railroad aficionados probably know that the Sunset Limited is the oldest “named” train in continuous operation in the United States. Operated by Amtrak since 1971, it is the descendent of a former Southern Pacific service dating to 1894. In addition to seeing natural and historical landmarks, passengers heading to or from New Orleans cross over one of the nation’s great engineering marvels: the Huey P. Long Bridge. 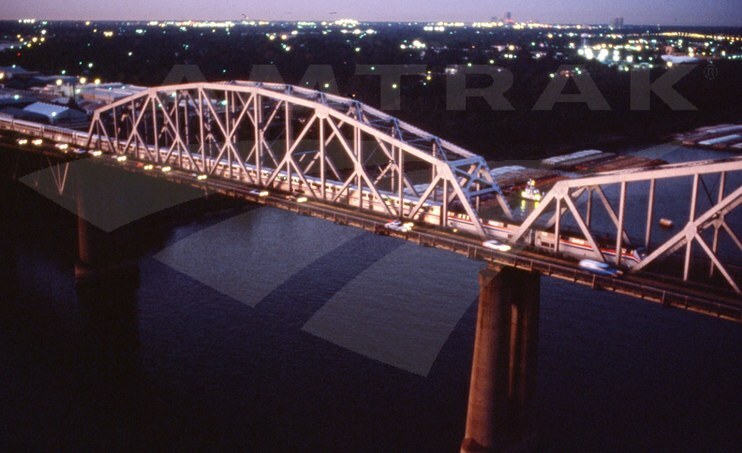 Since the company’s early days, Amtrak promotional material has shown the Sunset Limited on the bridge, often with the city of New Orleans as the perfect backdrop. The Sunset Limited crosses the Mississippi River over the Huey P. Long Bridge in the late 1970s. Located upstream and west of New Orleans in Jefferson Parish, the Huey P. Long Bridge was the region’s first permanent railroad and automobile crossing over the Mississippi River. Although long-dreamed of by railroad promoters and city boosters, bridge construction did not begin until 1933 during the Great Depression. Financing and construction was overseen by the Public Belt Railroad Association, a non-profit, city-owned corporation with a mission to better organize the rail lines serving the city and its extensive port facilities. To this day, the corporation, now known as the New Orleans Public Belt Railroad, owns, operates and maintains the railway portion of the bridge while the Louisiana Department of Transportation and Development maintains the roadway portion. When completed in 1935, the soaring structure was the longest steel trestle railroad bridge in the world. The well-known engineering firm of Modjeski, Masters & Chase, Inc. designed the 4.36 mile long bridge at a cost of $12.8 million. It originally contained two railroad tracks in the center, flanked by two-lane highways on either side. From 2006 to 2013, the state of Louisiana undertook a $1.2 billion project to widen the bridge by adding a lane and shoulder in each direction. Since its dedication, it has borne the name of Huey P. Long, who served as Louisiana’s governor and senator at the time. The Sunset Limited crosses the Mississippi River over the Huey P. Long Bridge in 1995. The photographs above from the Amtrak Archives show two views of the Sunset Limited on the bridge, one from the late 1970s and the other from 1995. The most noticeable difference is the trains’ consists. In the older image, the train includes a variety of single-level sleeping, dining, baggage and coach cars that Amtrak purchased from the predecessor railroads when it took over the nation’s intercity passenger rail services in 1971. 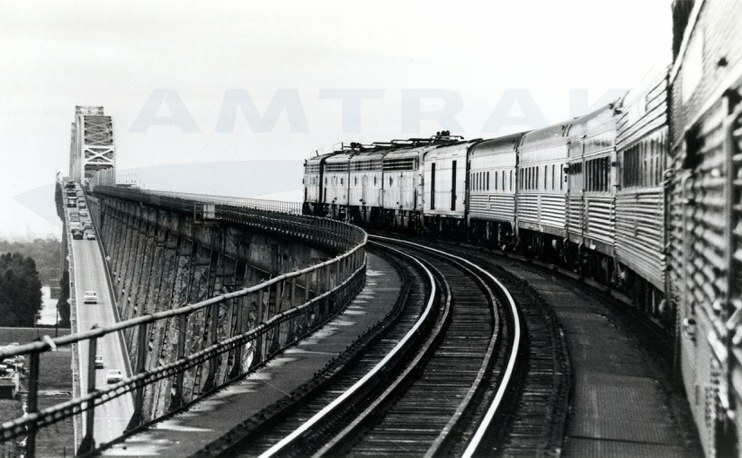 The later image shows the train made up of bi-level Superliner cars; although the first Superliners entered service in late 1979, they did not replace Heritage Fleet equipment on the Sunset Limited until early 1981. At the time the photo was taken in 1995, the route ran between Los Angeles and Miami via New Orleans; Amtrak suspended service east of New Orleans following Hurricane Katrina in 2005. The older black and white photograph is shot from an angle that allows you to see how the highway ramps and railroad portion of the bridge come together to cross the river, whereas the newer image emphasizes the bridge’s immensity and strength. Bathed in twilight’s soft light, it takes on a pinkish glow that makes it stand out against the dark shoreline. Looking far into the distance, you can spot the high-rises of New Orleans’s Central Business District southwest of the famous French Quarter. In this related image, the Superdome’s curving white mass is clearly visible. New Orleans is an important southern hub for Amtrak. North of the passenger depot, noted for colorful murals depicting the history of Louisiana, there is an Amtrak maintenance facility where employees perform running/turn around maintenance on all of the long-distance rolling stock and locomotives associated with the Sunset Limited, City of New Orleans (New Orleans-Memphis-Chicago) and Crescent (New Orleans-Atlanta-New York). The skilled shop employees also service and perform light overhauls for Viewliner and Heritage cars used on the Crescent. Check out these other great aerial photos of the Sunset Limited taken for the 1995 marketing campaign. Coco & Company, LLC, “Huey P. Long Bridge, Spanning Mississippi River approximately midway between nine & twelve mile points upstream from & west of New Orleans, Jefferson, Jefferson Parish, LA ,” Historic American Engineering Record, United States Department of the Interior, 2005.